If you need any extra incentive to add a dash of adrenaline to your next trip, consider this: Americans came in dead last in a recent survey designed to gauge travelers' taste for adventure, behind Kiwis, Canadians, Australians and Brits (in order of most to least adventurous). The survey, done by adventure travel specialist Intrepid Travel, asked 1,000 respondents from five countries to reveal how likely they were to try a variety of travel experiences. The "intrepid" survey choices included eating a deep fried tarantula, sleeping in village hut, going on safari, haggling at local markets and exploring ancient ruins. Traveling by motoconcho in the Dominican Republic. Standing at the corner of two remote roads on this friendly Caribbean island, I was already late (even for island time) for an appointment. My choices: Wait for the achingly slow local bus, pay through the nose for a taxi or hop on the back of a local guy's motorbike and go via motoconcho for a few bucks. I chose the latter (that's my driver, Luis, in the photo above after safely delivering me to my destination), and the helmet-free, exhilarating ride past sugarcane fields, tiny houses and crumbling cemeteries was a travel moment I will never forget. 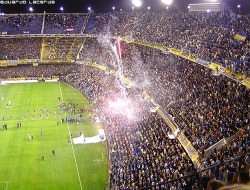 A soccer match in Buenos Aires. In Argentina's hip capital, futból falls among the most cherished passions. During a trip several years ago, I begged our guide to let me go, solo, to a match at La Bombonera, the iconic stadium of the city's favorite team, Boca Juniors (photo courtesy of Flickr/Eduardo Lacerda). Risky, yes, but one of the most exhilarating travel experiences I have ever had. The stadium swayed with jumping fans. Cheers and songs echoed for the entire 90 minutes. A must-do, whether you're a soccer fan or not. Exploring a coal mine in Chile. Like the rest of the world, I was riveted with the October rescue of the 33 Chilean miners. But, thanks to my own experience venturing into a Chilean mine several years ago, I had an especially deep appreciation of their strength and courage. The town was called Lota; the mine, Chiflón del Diablo, which means "whisper of the devil," and the four-hour tour, which took us more than 1,000 feet below sea level, left an indelible impression on me. Now, readers, it's your turn – please weigh in below with your most intrepid travel experiences. Crewing a catamaran in the Greek isles? Hiking in Nepal? Or just camping in your backyard (which, depending on where you live, could be adventurous in its own right)?